Welcome to The Motivation Station; a collection of inspiring quotes, lyrics, and other motivational snippets I have gathered. Feel free to comment your own motivating related content! Family, friends, and colleagues are just some of the people who help keep my spirits high – it sure helps to have a strong support network to aid motivation. Having motivation that comes from other sources is great too as people aren’t always around for support. Self-motivation tactics or motivation from an easily accessible source (e.g. a song, music piece, poem, film, etc.) is an incredibly useful tool to have. A great source of my motivation comes from a challenge or reaching an end goal and achieving. Sometimes I do get disheartened and that’s when a motivational pick-me-up comes in handy. ‘Do not give up, keep going’ were the words that have helped and continue to help me push through the tough times and to keep going. Growing up through school took its toll though and slowly I was losing momentum and hope. 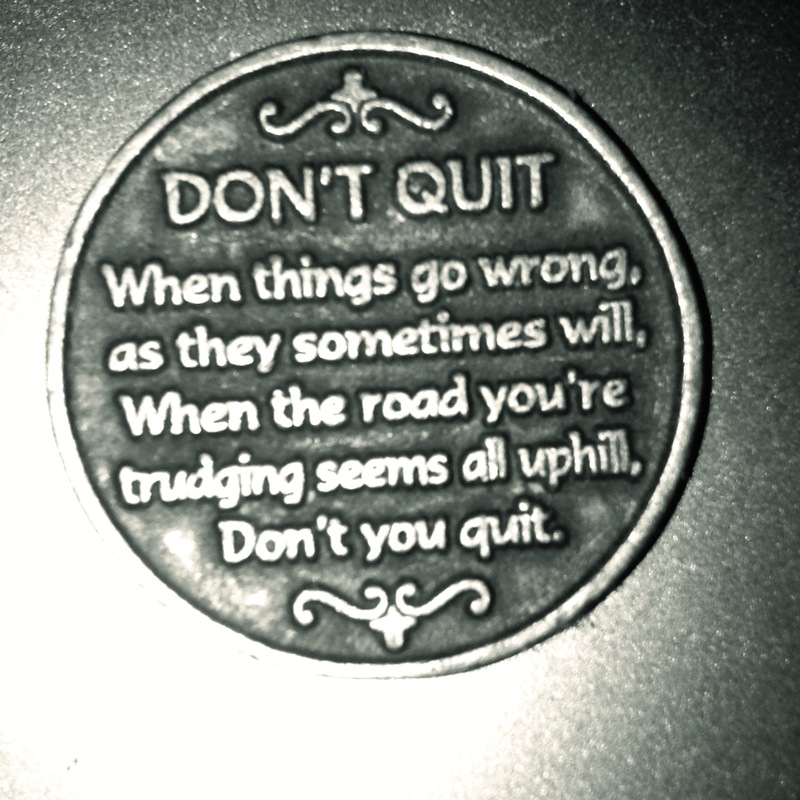 Then on a school trip, I found a coin in the gift shop with a ‘Don’t Quit’ poem written on it. Just seeing it reignited an element of hope within me. The coin still lets me know to never give up but it also serves as a reminder of how far I have come since the dark times. It’s perfectly natural to have a hero/heroine growing up, whether they’re from the real world or fictional. While I don’t exactly have a motivational character now that I am an adult I did when I was young. They are responsible for helping create a foundation of my motivation. The mantra “I think I can” comes from the famous classic book ‘The Little Engine That Could.’ Tillie, The Little Blue Engine from the 1991 film adaptation, inspired me to keep going when I was young and I created my mantra of ‘Do not give up, keep going’ from her. Fun Fact: I chose blue as one of the main colours for DyspraxicFantastic as an homage to Tillie. Warrior is a clumsy tugboat from the TV series Tugs. He didn’t inspire me anywhere near the extent that Tillie did, but that doesn’t make him any less of a motivational character in my eyes. He was the first character that I found I could relate to on a ‘Dyspraxia’ level or more accurately a clumsy level as it was before my own diagnoses. Warrior doesn’t officially have Dyspraxia, but in my opinion, he ticks off various traits. In any case, he was one of my icons growing up. There are countless songs that perfectly lift your spirits or empowers you in such a way that you feel you can take on any challenge thrown your way. There are simply too many songs to list all of them and so any lyrics or songs that particularly stand out to me I’ll create a poster for it. Memes are the internet’s catchphrases and are a popular way of sharing content. Memes are constantly changing and ‘evolving’ and range from hilarious to absurd. They are used for a quick laugh but when used in a certain way can also be used as a learning tool. 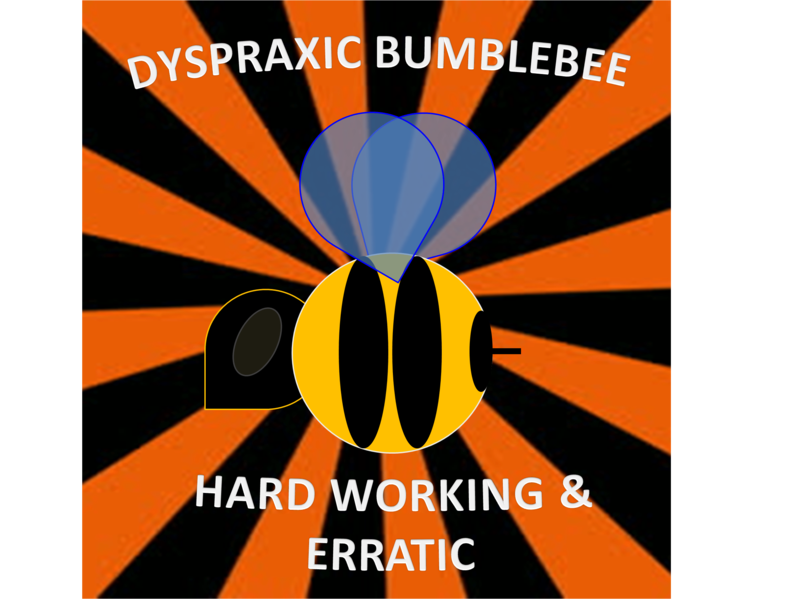 Dyspraxia memes already exist in the form of Dyspraxic Panda, but I think bumblebees or even dragons suit fit the dyspraxia image better. I like to inject some light and humour into the world of Dyspraxia, learning to laugh at the little mishaps really does help so occasionally I’ll create something to upload.